There is nothing more scarier than surgery, chemo and radiation. It’s the modern legal torture. And finding how to cure breast cancer naturally has become more attractive than ever. Acupuncture with bee venom, also known as apipuncture, has proven to be a reliable method, though not at handy for everyone. This article presents the case of a woman who managed to do it and was highly rewarded. Breast cancer is the second most common cause of death from cancer in women in the United States, after lung cancer. About 1 in 8 U.S. women (about 12.4%) will develop invasive breast cancer over the course of her lifetime. As of January 2018, there are more than 3.1 million women with a history of breast cancer in the U.S. How can this not be scarring? Every woman fears this. If we are lucky not to hear it from a relative who has it, we still hear it from an acquaintance or from an organization fighting against it. It seems it’s everywhere. And while when it comes to other bad diseases, we can take action and somehow take control of our lives (we can give up smoking or drinking, we can lose weight or stop taking drugs), when it comes to cancer there is nothing we can actually do to prevent its appearance. Because healthy people can suddenly get it, too. And living under its threat is not helping either. Breast cancer is the nightmare of women. The entire world knows about Angelina Jolie’s gesture of removing her breasts so they don’t get the disease. It’s paranoia, say some specialists. It may be, but it gives us a clue of how much this constant threat affects our lives. Case study of healing breast cancer naturally. Here is the story of Tara Coyote, who took care of a friend with acute myeloid leukemia. This friend followed the allopathic procedures with chemotherapy and bone marrow transplant and had a hell of 22 months of agony followed by a tragic end. The following year Tara herself was diagnosed with stage three breast cancer. After watching her friend being tortured by modern medicine, she decided to try a natural approach. Her greatest quality of all was that she never gave up. For the next 8 month she tried everything that might work. – a myriad of strange tasting liquids such as Chinese herbs, a fermented Chinese soy drink called Haelan, turkey tail tea. And then she tried bee venom therapy. The use of bee venom is known more as apitherapy, though in Europe and Asia this term means therapy with all products of the hive, not only bee venom. It has been used since ancient times and scientific research confirms its efficiency in multiple sclerosis, arthritis, Alzheimer’s disease, Parkinson’s disease. Bee venom is used in homeopathy or to treat bee sting allergy. But it is also used to heal cancer. …stinging my breast with live bee venom on a daily basis! Tara started some sessions of acupuncture with bee venom with Tamara Wolfson, an osteopathic acupuncturist, owner of Lady Bee Botanicals in Fairfax, CA. The good results were felt even after the first 2 sessions. She was being stung by live bees every day. That’s definitely not easy. Yet, easier than surgery, chemo and radiation. How was the treatment done? The acupucturist used a unique and rare method of micro-dosing patients with bee venom. While holding a bee with tweezers, she was able to gently apply multiple stings with the same bee without the bee losing her stinger. Thus, the patient gets multiple doses of medicine while the bee keeps its life. Accupuncture had a key role. The treatment involved acupuncture knowledge. The therapist first placed acupuncture needles on specific meridian lines where she felt the sick body needed healing. Then, she would use the live bee on acupuncture meridian lines to deepen the session. And Tara said: The result was powerfully cathartic! As the cancer dies off, the liver must process the dead cells and that creates congestion. (There is also a strong connection between breast cancer and the liver in Chinese acupuncture.) Through manual manipulation, the apitherapist physically released some of these tight spots before inserting the acupuncture needles. Once the needles were placed it was time for the apitherapy. It is known that when a honey bee stings you it will soon die, because a part of its abdomen would got stuck with the stinger, in the human’s skin. It is also true that many apitherapists let the bee lose its stinger, which causes the bee to die. Nevertheless things can be different. The apitheratpist of our case had a different approach. Gently holding the female bee with tweezers, she brought it near the breast and the bee gently inserted the stinger near the tumor. It was quick, the bee didn’t lose its stinger and only a small amount of venom entered the system. The bee can even chose if she wants to sting or not. If not, the apitherapist would choose another one that does. After Tamara, our patient found Heather Luna, a clinical herbalist, apitherapist and director of the Acorn School of Herbal Medicine., who lived nearby and was easier to reach. She started with 2 stings around the breast and reached 5 per session (twice per week). Eventually, she was confident to work with the bees directly, stinging herself. Then she met Cheyanna Bone, a wise woman who learned her the mysteries of beekeeping and helped her grow her first hive. How does she sting herself? Here’s what she says: “I very gently take a bee from her abdomen with tweezers and hold her up to the area where I want to be stung. 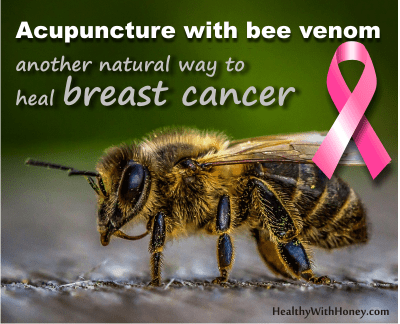 By allowing her stinger to pierce my skin, the bee venom is administered directly to the breast tumor tissue. I usually sting myself three to five times around the breast, like a bull’s-eye. The stinging does hurt a bit, but my body has adapted to the venom.” The bee dies in the process. Our patient uses an alternative blood test called the ‘RGCC’ or ‘Greece’ test to chart my progress. Every few months, her blood is sent to Greece to check the amount of circulating tumor cell counts in her blood. Test results show that she is definitely healing, and the cancer is contained. Tara Coyote’s story can be found on cancerwarrioress.com, and honeycolony.com. She lives in Northern California and teaches Equine Facilitated Learning, helping humans gain awareness through the power of the horse. Thank you, Tara, for sharing your story with the world and for giving us hope that life can be lived without chemo. Tamara Wolfson L.Ac. MSTCM, offers training courses that you can find on the healthiveacademy.com, her clinic is on 85 Bolinas Rd Ste 7 Fairfax, CA 94930. The above reported case is not at random. There are numerous studies, in vitro and in vivo, as well as clinical trials that have demonstrated the amazing power of bee venom therapy for the treatment of a variety of conditions such as arthritis, rheumatism, pain and cancer. Bee venom is a complex substance with a wide variety of pharmaceutical properties. It contains at least 18 active components, including enzymes (such as PLA2), peptides (including melittin, apamin, adolapin, and the MCD peptide. ), biogenic amines (e.g. histamine and epinephrine) and nonpeptide components including lipids, carbohydrates and free amino acids (Lariviere & Melzack, 1996). 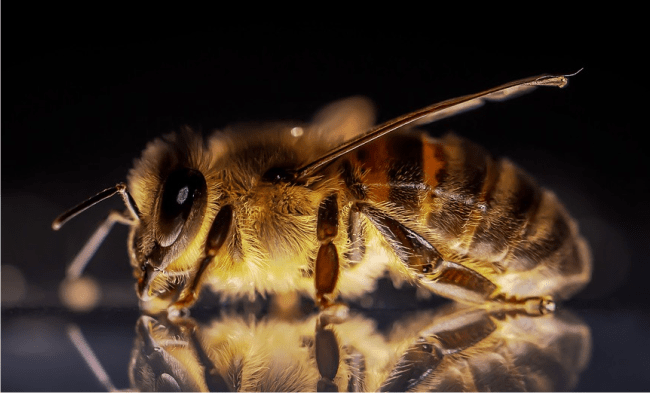 According to research bee venom might modify the immune system functions in the body and contribute to the increased production of cortisol (Vick et al.,1972). The bee venom anti-cancer activity was studied by Liu et al., 2002; Hu et al., 2006; Putz et al., 2006; Moon et al., 2006 and many others. The cell cytotoxic effects through the activation of PLA2 by melittin (the principal toxin, a small protein containing 26 amino acid residues) have been suggested to be the critical mechanism for the anti-cancer activity of bee venom. In contrast to normal eukaryotic cells with a low membrane potential, the cell membranes of prokaryotic and cancer cells maintain a large membrane potential. Hence, many lytic peptides selectively disrupt the cancer cell membranes rather than those of normal cells. The cell cytotoxic effect through the activation of PLA2, caspase and MMP, which destroy cancer cells, is suggested as an important basic mechanism for the anti-cancer activity of bee venom (Holle et al., 2003; Moon et al., 2006). A conjugation of melittin with hormone receptors, and gene therapy carrying melittin can be useful as a novel targeted therapy for some types of cancers such as prostate and breast cancer because these delivery system can more effectively to kill cancer cells (Li et al., 2004; Russell et al., 2004; Li et al., 2006; He et al., 2006). • The 2018 study Anti-cancer effect of bee venom on human MDA-MB-231 breast cancer cells using Raman spectroscopy., by a South Korean team conducted by Jung GB, demonstrated the apoptotic effect of bee venom on human MDA-MB-231 breast cancer cells using Raman spectroscopy and principal component analysis. • Venom Immunotherapy or HOW TO TREAT BEE STING ALLERGY FOR GOOD! A natural treatment for flu and colds What is almond honey? And where is it?